· Promotes differentiation of neural progenitor cells from human pluripotent stem cells (Morizane et al., Zhou et al.). · Promotes differentiation of cardiomyocytes from mouse and human pluripotent stem cells (Hao et al., Kattman et al.). · Promotes differentiation of adipocytes and suppresses osteogenic differentiation of osteoblasts from human mesenchymal cells (Kim et al.). Human mesenchymal stem cell differentiation to the osteogenic or adipogenic lineage is regulated by AMP-activated protein kinase. AMP-activated protein kinase (AMPK) is an energy-sensing kinase that has recently been shown to regulate the differentiation of preadipocytes and osteoblasts. However, the role of AMPK in stem cell differentiation is largely unknown. Using in vitro culture models, the present study demonstrates that AMPK is a critical regulatory factor for osteogenic differentiation. We observed that expression and phosphorylation of AMPK were increased during osteogenesis in human adipose tissue-derived mesenchymal stem cells (hAMSC). To elucidate the role of AMPK in osteogenic differentiation, we investigated the effect of AMPK inhibition or knockdown on mineralization of hAMSC. 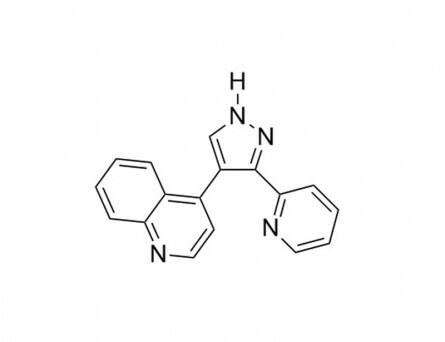 Compound C, an AMPK inhibitor, reduced mineralized matrix deposition and suppressed the expression of osteoblast-specific genes, including alkaline phosphatase (ALP), runt-related transcription factor 2 (RUNX2), and osteocalcin (OCN). Knockdown of AMPK by shRNA-lentivirus infection also reduced osteogenesis. In addition, inhibition or knockdown of AMPK during osteogenesis inhibited ERK phosphorylation, which is required for osteogenesis. Interestingly, inhibition of AMPK induced adipogenic differentiation of hAMSC, even in osteogenic induction medium (OIM). These results provide a potential mechanism involving AMPK activation in osteogenic differentiation of hAMSC and suggest that commitment of hAMSC to osteogenic or adipogenic lineage is governed by activation or inhibition of AMPK, respectively. Stage-specific optimization of activin/nodal and BMP signaling promotes cardiac differentiation of mouse and human pluripotent stem cell lines. Efficient differentiation of embryonic stem cells (ESCs) and induced pluripotent stem cells (iPSCs) to a variety of lineages requires step-wise approaches replicating the key commitment stages found during embryonic development. Here we show that expression of PdgfR-α segregates mouse ESC-derived Flk-1 mesoderm into Flk-1(+)PdgfR-α(+) cardiac and Flk-1(+)PdgfR-α(-) hematopoietic subpopulations. By monitoring Flk-1 and PdgfR-α expression, we found that specification of cardiac mesoderm and cardiomyocytes is determined by remarkably small changes in levels of Activin/Nodal and BMP signaling. Translation to human ESCs and iPSCs revealed that the emergence of cardiac mesoderm could also be monitored by coexpression of KDR and PDGFR-α and that this process was similarly dependent on optimal levels of Activin/Nodal and BMP signaling. Importantly, we found that individual mouse and human pluripotent stem cell lines require optimization of these signaling pathways for efficient cardiac differentiation, illustrating a principle that may well apply in other contexts. Small-molecule inhibitors of bone morphogenic protein and activin/nodal signals promote highly efficient neural induction from human pluripotent stem cells. The balance of bone morphogenic protein (BMP), transforming growth factor-β (TGFβ)/activin/nodal, and Wnt signals regulates the early lineage segregation of human embryonic stem cells (ESCs). 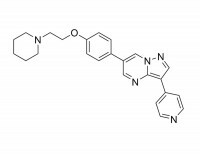 Here we demonstrate that a combination of small-molecule inhibitors of BMP (Dorsomorphin) and TGFβ/activin/nodal (SB431542) signals promotes highly efficient neural induction from both human ESCs and induced pluripotent stem cells (iPSCs). The combination of small molecules had effects on both cell survival and purity of neural differentiation, under conditions of stromal (PA6) cell coculture and feeder-free floating aggregation culture, for all seven pluripotent stem cell lines that we studied, including three ESC and four iPSC lines. Small molecule compounds are stable and cost effective, so our findings provide a promising strategy for controlled production of neurons in regenerative medicine. High-efficiency induction of neural conversion in human ESCs and human induced pluripotent stem cells with a single chemical inhibitor of transforming growth factor beta superfamily receptors. 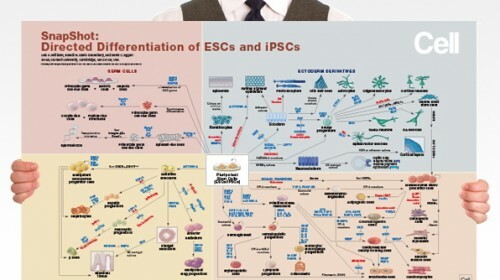 Chemical compounds have emerged as powerful tools for modulating ESC functions and deriving induced pluripotent stem cells (iPSCs), but documentation of compound-induced efficient directed differentiation in human ESCs (hESCs) and human iPSC (hiPSCs) is limited. 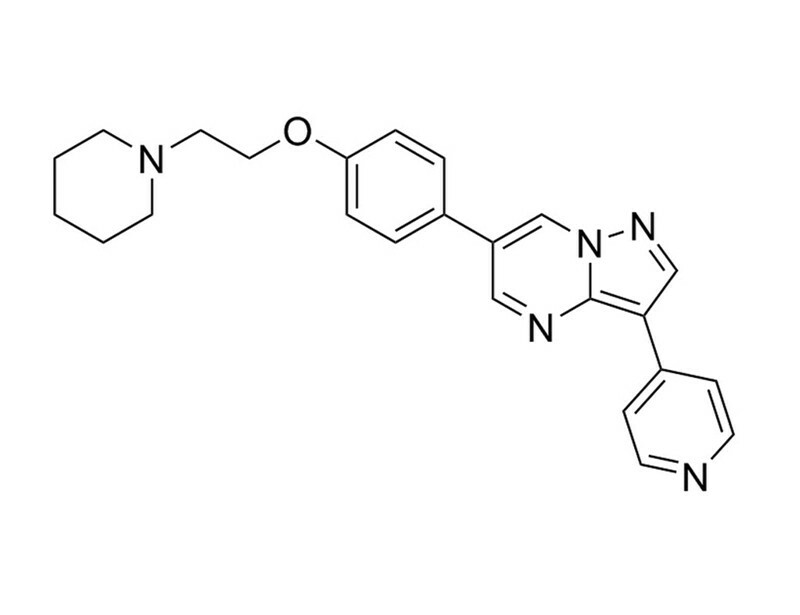 By screening a collection of chemical compounds, we identified compound C (also denoted as dorsomorphin), a protein kinase inhibitor, as a potent regulator of hESC and hiPSC fate decisions. Compound C suppresses mesoderm, endoderm, and trophoectoderm differentiation and induces rapid and high-efficiency neural conversion in both hESCs and hiPSCs, 88.7&percnt; and 70.4&percnt;, respectively. Interestingly, compound C is ineffective in inducing neural conversion in mouse ESCs (mESCs). 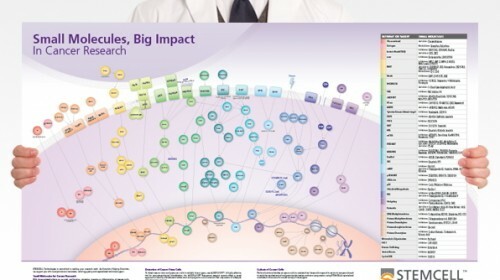 Large-scale kinase assay revealed that compound C targets at least seven transforming growth factor beta (TGF-β) superfamily receptors, including both type I and type II receptors, and thereby blocks both the Activin and bone morphogenesis protein (BMP) signaling pathways in hESCs. Dual inhibition of Activin and BMP signaling accounts for the effects of compound C on hESC differentiation and neural conversion. We also identified muscle segment homeobox gene 2 (MSX2) as a downstream target gene of compound C and a key signaling intermediate of the BMP pathway in hESCs. Our findings provide a single-step cost-effective method for efficient derivation of neural progenitor cells in adherent culture from human pluripotent stem cells. 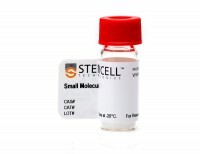 Therefore, it will be uniquely suitable for the production of neural progenitor cells in large scale and should facilitate the use of stem cells in drug screening and regenerative medicine and study of early human neural development. Dorsomorphin, a selective small molecule inhibitor of BMP signaling, promotes cardiomyogenesis in embryonic stem cells. 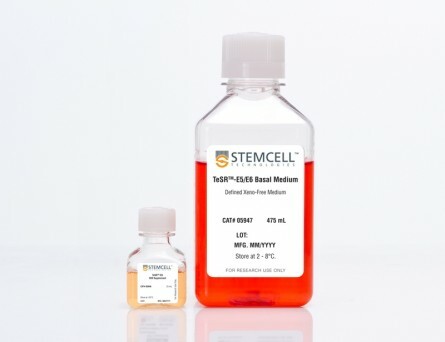 BACKGROUND Pluripotent embryonic stem (ES) cells, which have the capacity to give rise to all tissue types in the body, show great promise as a versatile source of cells for regenerative therapy. 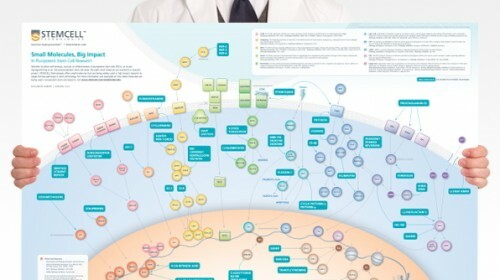 However, the basic mechanisms of lineage specification of pluripotent stem cells are largely unknown, and generating sufficient quantities of desired cell types remains a formidable challenge. 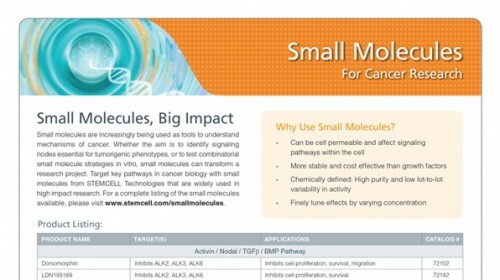 Small molecules, particularly those that modulate key developmental pathways like the bone morphogenetic protein (BMP) signaling cascade, hold promise as tools to study in vitro lineage specification and to direct differentiation of stem cells toward particular cell types. 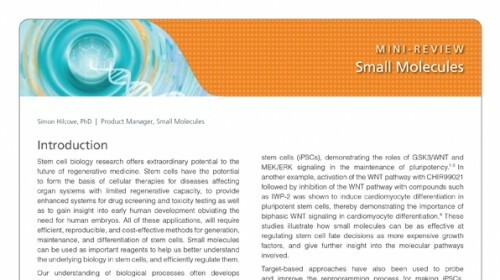 METHODOLOGY/ PRINCIPAL FINDINGS We describe the use of dorsomorphin, a selective small molecule inhibitor of BMP signaling, to induce myocardial differentiation in mouse ES cells. Cardiac induction is very robust, increasing the yield of spontaneously beating cardiomyocytes by at least 20 fold. Dorsomorphin, unlike the endogenous BMP antagonist Noggin, robustly induces cardiomyogenesis when treatment is limited to the initial 24-hours of ES cell differentiation. Quantitative-PCR analyses of differentiating ES cells indicate that pharmacological inhibition of BMP signaling during the early critical stage promotes the development of the cardiomyocyte lineage, but reduces the differentiation of endothelial, smooth muscle, and hematopoietic cells. 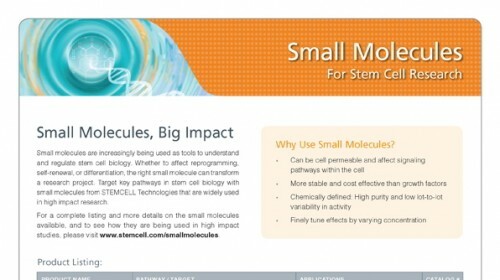 CONCLUSIONS/ SIGNIFICANCE Administration of a selective small molecule BMP inhibitor during the initial stages of ES cell differentiation substantially promotes the differentiation of primitive pluripotent cells toward the cardiomyocytic lineage, apparently at the expense of other mesodermal lineages. 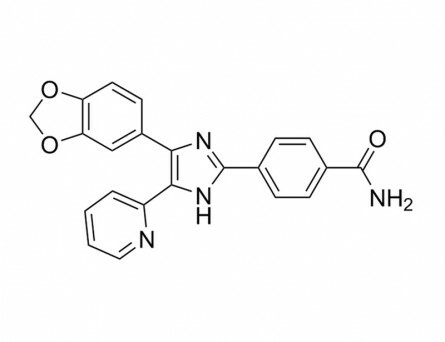 Small molecule modulators of developmental pathways like dorsomorphin could become versatile pharmacological tools for stem cell research and regenerative medicine.